Relax, worry-free, in the Pride Mobility Essential Collection Power Lift Recliner LC250. 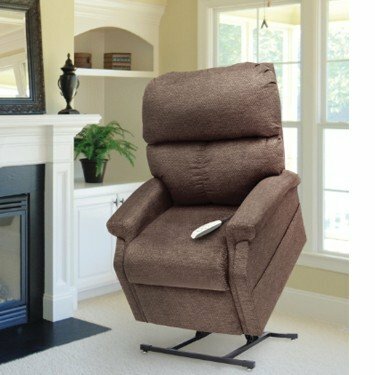 This super-comfortable and practical power recliner helps you get out of your seat safely without exerting too much effort, and features a range of handy and stylish finishes that make it a practical addition to your home. This Pride lift recliner is equipped with comfy, over-stuffed fiber-filled backs and comes in a range of exquisite colors to match your particular d©cor. What's more, Pride lift recliners are made with a patented, smooth and quiet operation system featuring a heavy-duty lift actuator and scissor mechanism, plus integrated battery backup.